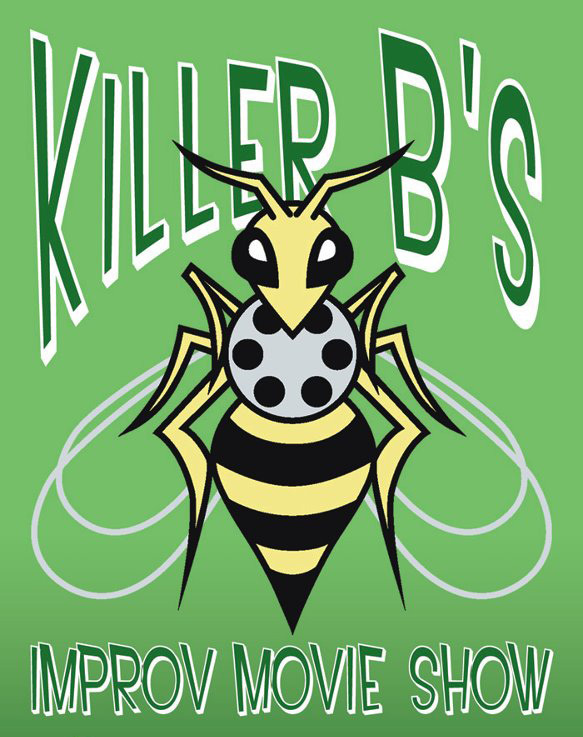 Around seven or eight years ago, Jerry Belich and I founded Killer B’s Improv Movie Show. 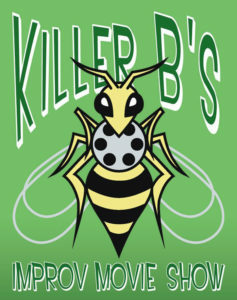 For those of you who don’t attend CONvergence or shows at HUGE Theater, Killer B’s is something like a hybrid between Mystery Science Theater 3000, J-Men Forever, and Comedy Sportz. I find clips of oddball film footage, edit them together, and remove all the sound. Then, a team of comedians and a Theremin player replace the entire soundtrack during a live show. Since the people doing the sound work have no idea what is going to play on screen, the comedy is pure improv. The project started, oddly enough, as a sort of avant garde music format. Originally, I was just going to find the movies and strip the sound, and Jerry was going to play Theremin to the footage. I can’t remember who thought of adding voice actors, but that’s really what made the show come together. See, I’ve been a longtime fan of the Twin Cities’ improv comedy community. I’d see Improv a Go Go almost weekly at the Brave New Workshop, watching actors forge experimental new improvisational formats for the pittance of a $1 admission. (IAGG is now at HUGE and costs $5, but this Wild West attitude toward improv comedy continues today.) While I have some stage experience myself, I always knew that stage improv was never my strong point, so I always watched in awe as I saw friends form strange comedic alchemy in front of me. I could see how the gears fit together, but never could get to the point where it felt natural to do improv comedy myself. The Killer B’s format, though, was a eureka moment for me. I could contribute back to the community that I loved so much. I just had to play to my particular skills: a vast knowledge of obscure films, competency at Final Cut Pro, and friendships with other talented people. The team sprang together. I was the editor. Jerry was on Theremin. Three talented comedians from Soylent Theater, all geeks and all very funny, formed the core of the voice talent: Joseph Scrimshaw, Kelvin Hatle, and Tim Uren. Other voice actors have joined us for various shows: Nels Lennes, Aric McKeown, Amanda Schuckman, Wally Wingert, Chuck McCann, Richard Fish, and Phil Proctor. We’ve also been joined onstage by guitarist Scott Keever and foley artist Tony Brewer. All have been fantastic to work with. Everyone brings something different to the table. However, do you notice anything about that lineup? I sure do. I’ve always wanted more women to be part of Killer B’s. It frustrates me that we’ve only ever performed with one lady in the cast. I’m pleased as punch that our Token Female Voice is AMAZING at comedy, and is always an audience favorite. However, she does not live in the Twin Cities area, and we don’t often get to perform with her. It’s not like I haven’t been trying to get more funny ladies in the cast. I’ve asked probably a dozen women in the local improv community to join us, but the timing has never worked out. In fact, Killer B’s probably wouldn’t exist today if it hadn’t been for the help of Jill Bernard, who was the first person I went to for advice when we decided to turn the show into a comedy routine. I’d LOVE to work with Jill, or with Jen Scott, or with Lauren Anderson, or with any number of fantastically funny women in this community. It’s just never worked out. Part of the issue is the format itself. We’ve learned through trial and error that the show works best with four voice actors, and can handle five at maximum. At the Five Actors Point, people start stepping on each other’s comments. With six actors, the show becomes unmanageable. If the core group is Kelvin, Joseph, and Tim, and if Aric almost always joins them, there’s just very little room to add anyone else. I’m certainly reluctant to drop any of these fine gents from my cast just because they aren’t female. After all, they know the format better than anyone else, and they work extremely well together as a team. So I heard Adam Carolla’s comments a few weeks ago with some frustration. Of course women are as funny as men. I’ve seen Amanda run comedic circles around the guys, when we’ve been lucky enough to have her. I’ve seen the ladies of Vilification Tennis stand toe-to-toe with the men, and be just as balls-out offensive and bold. But I can’t help wondering if my show is part of a problem. Even though I know I’ve made an effort to include women, we simply don’t have the track record to show that. But in a cast this small, is affirmative action fair at all? Just some things on my mind. That, and I wish Tony Brewer lived closer, because having a foley artist at the CONvergence 2012 show was COMPLETELY AWESOME. P.S. — Yes, I know I’m a woman. However, I’m not counting myself, because I’m not actually up on stage during the show. If I didn’t announce the show beforehand, I doubt anyone would know a woman was part of it at all. Also, since I’m the person who put together the rest of the team, I feel righteous in my guilt for not being able to build in more of these awesome funny ladies I know. I don’t think your guilt is misplaced. Not that you’ve set out to exclude women, but I think your instinct about this kind of dynamic contributing to the larger problem of lack of exposure for female comics is probably accurate. And I applaud your willingness to look in the mirror and honestly analyze your part in something that you clearly think is a problem. I think you should try to figure out a way to get more women involved. Have you talked to your regular cast members about this? I imagine it wouldn’t be too difficult to implement some kind of rolling lineup. Even if you were able to find one woman who wanted to be involved on a fulltime basis, you could just have the four or five guys take turns sitting out a session. If they’re worth their salt, they’d gladly play a little less to make room for a funny lady or two. Yup, we as a team have talked about this several times. I like the rolling cast idea. I think the reason something like that has never been brought up before is due to the fact that we have very few shows per year. Because of that, when a show does come up, everyone wants to play. If we get another weekly run at HUGE Theater this year, I might give that a shot. “Roling cast” was my first thought, too. I do understand the desire not to miss out on a show when there are so few each year, though. So, how do we solve this conflict? By making the Killer Bs so ridiculously popular that you need to do more shows, of course! Now, how can we, the hilarious female geek community, help make that happen? No, I was serious there for s second. How can we help? Advertising? Material contributions? Babysitting? What is the limiting factor here and how do we fix that? One thing I learned from doing the one month run at HUGE last year was that a once-per-week Killer B’s show is a killer amount of work. Essentially, I was locating footage for and editing an hour long film every single week. For a person with a day job, that’s pretty steep.